Thank your Guardian Angel, who is trying to help you get to heaven. Today is his feast day. It is hard to admit for a civilized person, but I have come to the conclusion that some people just want to choose evil. Many years ago, I read a superb book, People of the Lie, by M. Scott Peck. I had read another book of his and was fascinated to read that some people just choose, for many reasons, a life of fear, unhappiness, even evil. In this book, the author looks at the root of evil, admitting it exists and that people freely choose to be mean, cruel, lie, cheat, steal and so on. For me reading this book while still relatively young, I was faced with someone who understood original sin and the person of satan. I know that I have met, perhaps, more evil on line, in twitter, with trolls and with those readers who seem to read my blog only to try to insult and undercut what I have to write irrationally. One reason, which I alluded to in the last post, I left twitter, was that I discovered, with the help of two other people, two women who were imitating other writers, including priests, and making horrible comments about others online. These two women seemed to be taking a perverse pleasure in just being cruel. Now, some others online had been doing the same type of ad hominem comments against bloggers, journalists and others, but most were using either their own names or a known nom de plume. But to adopt multiple personas in order to attack seemed to indicate either troubled minds, or, people who were choosing evil. Such are the dangers of living in the blogosphere or in twitterdom. Thinking about these occasions, I began to rethink M. Scott Peck's definitions of "group evil", as including the ability to hide in a group and commit even atrocities, such as the My Lai Massacre, he studied. Now, of course, such massacres are not equal to the evil tongues or fingers on twitter and in com boxes, but the impetus to remain anonymous in order to perpetrate maliciousness is similar. We must accept that some people just choose evil, and, therefore, hell. Those who have fought in wars know something of the choices men and women make which are truly evil. We have many examples daily of atrocities done either individually or in groups which are just downright satanic. Those on the net who choose to insult goodness, undermine goodness and drag reputations into mud think they are hiding. But, there is Someone Who sees all and will judge evil as evil and good as good. God ultimately judges each action we do, each word we say. He watches us use our free will either to follow Him or move away from Him into darkness. The group evil and anonymous evils on the Net will not remain hidden. 2 For there is nothing covered, that shall not be revealed: nor hidden, that shall not be known. Written on a train somewhere in Virginia. For some reason, this younger ones think it is OK to be rude. Why, I do not know why. One reason I stopped being on twitter was the level of rudeness from the commentators. I do not mind getting into a great discussion and disagreeing with people, as long as those engaged are courteous. Politeness is no longer considered necessary or a virtue. What has happened? The other problem seems to be hyper-criticism for those on line. Would a person who is a friend talk to another by attacking personal characteristics? 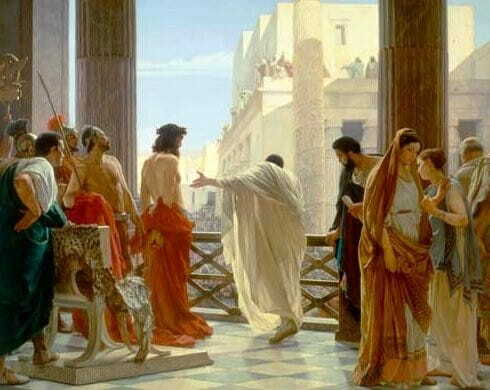 I have been in conversations with other Catholics who have attacked each other so much that one loses track of the argument. Why has discourse fallen to such levels? Partly, as I have written many times, that students are not taught logic or debate anymore. Part of it is a false idea of honesty, which means that a person believes that he has the right to be rude. Part of it is a new aggression, a new barbarism, which created an atmosphere wherein people do not want to learn, but only score points, be "right", destroy the arguments of others, instead of listening and discussion. Rudeness is not Christian. A Christian tries to understand another person, where "she is coming from..." and a Christian places a discussion into a context of respect and love. And, unlike many Asian cultures, the young ones of the West no longer respect age or experience. We need to teach manners and listening skills, debate and logic before all conversation comes to an end. The day that happens is the day the civilization may be declared "dead".One of the end products of rudeness is the lack of conversation, the proliferation of judgement, the inability to influence another by both discussions and example. A civilization depends on rational communication. Part of the problem is that people are not talking to each other face to face. Tweets and texts create a false sense of "letting boundaries go". Yesterday, I asked a priest to pray for me for concerning immigration issues. He did not believe me when I said I could not get into my country of choice because I was poor. 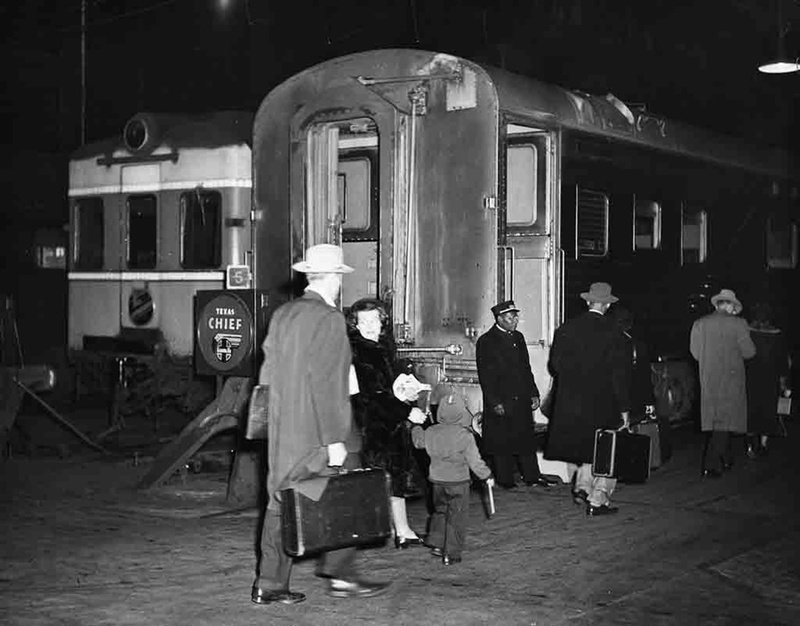 I experienced prejudice, the prejudice of those who think all Americans are rich, and the prejudice of those who cannot believe the country I mentioned is so anti-immigration. The priest simply did not believe my tale of not being allowed to live in the same country as my only child. I experienced what thousands of people who immigrate experience daily-a reaction which is based on Calvinism. A friend of mine said to me after this conversation, "The priest does not believe you." Those who have never experienced rejection of any kind because of poverty simply cannot comprehend this type of prejudice, and, therefore, they fall into another type of prejudice. Being "white" is no longer a privilege of race in some places. Being poor creates suspicion in those who have never been poor, or who have received help in immigration issues because they are not white. A poor, white person is not worthy of help, or even prayer. God allowed this humiliation. He allowed me to know what it is like to be looked down on by another who is supposedly a good person. The priest is an immigrant who had no problem coming to the country of his choice. Therefore, he cannot understand my predicament. He is not sympathetic. I forgive him. I forgive all who judge the poor as unworthy, or extra-sinful, or failures. God allows some people to be poor and some to be rich. He allows some people to suffer more than others. As a person who has never been prejudice, having Latinos for close playmates as a young child, and, in fact, dating a black man in my youth, (causing all the neighbors to make comments to my mom, who defended me and the very nice young man,) I find it hard to understand prejudice. Some of my friends are working class and some are professionals. Some are poor and some are rich. Some are middle class and some are very wealthy. So what? I shall pray for this priest who did hurt my feelings, for an instant. Then, I realized that God had given me a chance to be humbled. As I write this, I am smiling. If I "get" this lesson, I am closer to God's goal for me. Humility in love. 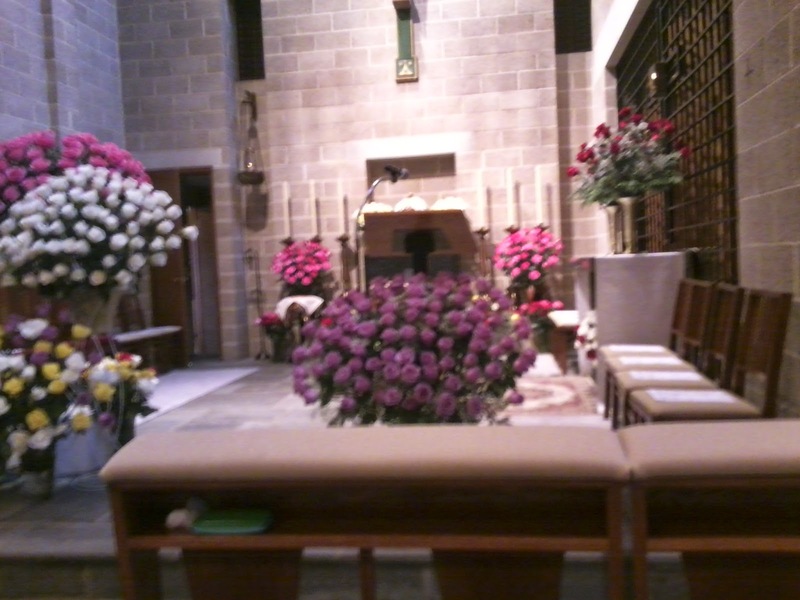 Last night, I attended Benediction and a prayer service for the Feast of St. Therese. 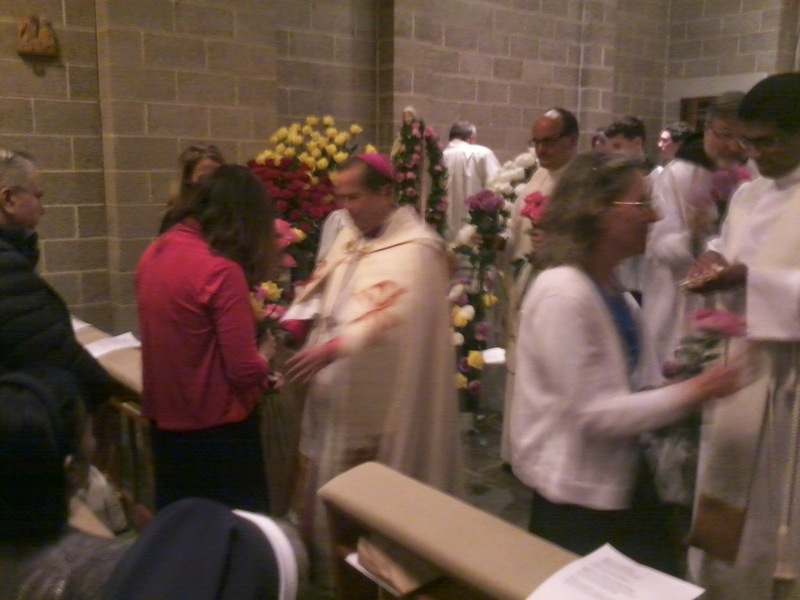 At the end of Adoration, we got to kiss a relic of St. Therese, and after the blessing of the roses, we each received several. I, happily, was handed a white one and a red one. 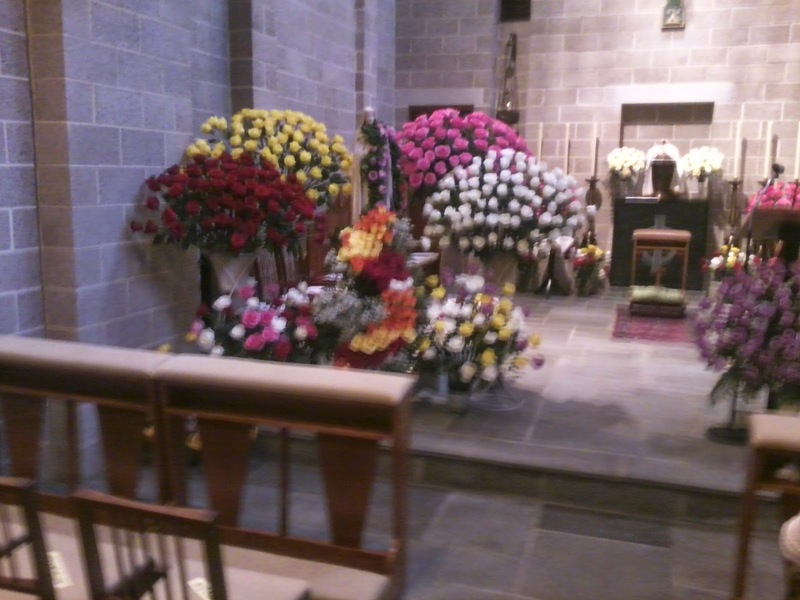 A man had donated 100 dozen roses to the Carmelite Monastery in honor of his mother who died. Here are some of the photos from this wonderful occasion. 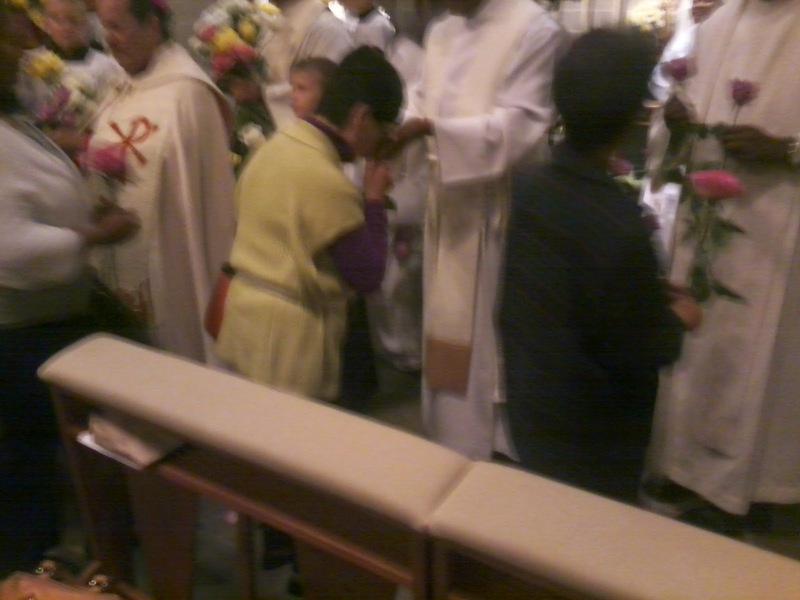 Bishop Cruz passed out the flowers. 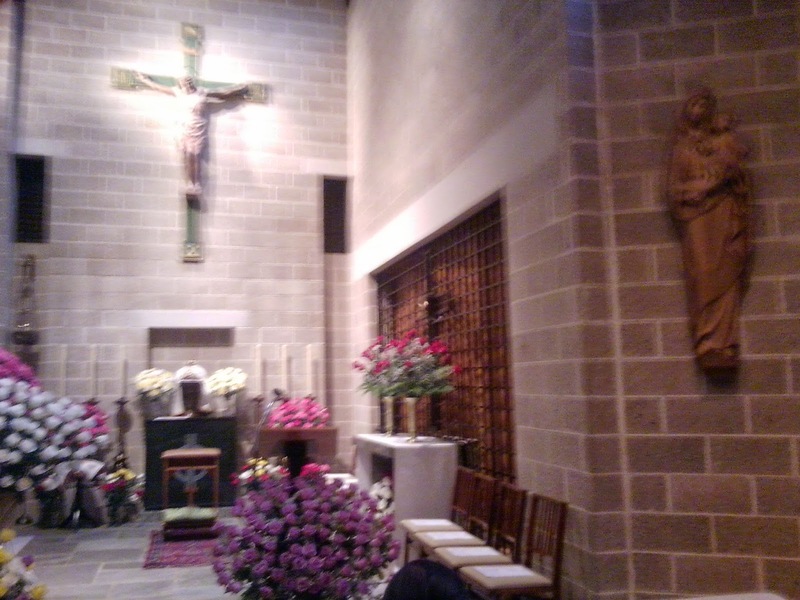 Yesterday, I went on several trips to various churches in the area, a pilgrimage day. I shall get photos later from a friend who took pictures. Bear with me. Will be in a train all day today. Pray for my travels, please.